It is with no shortage of embarrassment and a healthy dose of humility that I must declare this to be a contender for the longest restoration project (of a six) in history! I commenced Kyria’s restoration in 1993 (when I was at the ripe old age of 21) and now, some 24 years later, it is still ongoing! To be fair, only the first 3 years of the 24 were spent actively engaged in the restoration. It seems that youthful enthusiasm can only take you so far in a project such as this. For the remainder of that time Kyria has been graciously lying dormant under a protective cover, patiently awaiting for her owner to resurrect the project. By the late 1980's and early 90's it had become clear that Kyria needed a complete refastening. 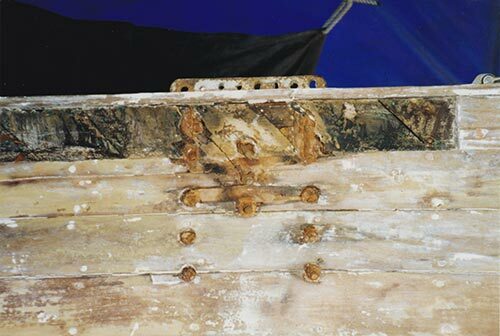 Her planking was fastened with brass screws and these had deteriorated due to a process known as de-zincification. Brass is an alloy of copper and zinc and when exposed to seawater there is a tendency for the zinc to be gradually leached away, leaving behind a porous copper-rich structure that has little mechanical strength. 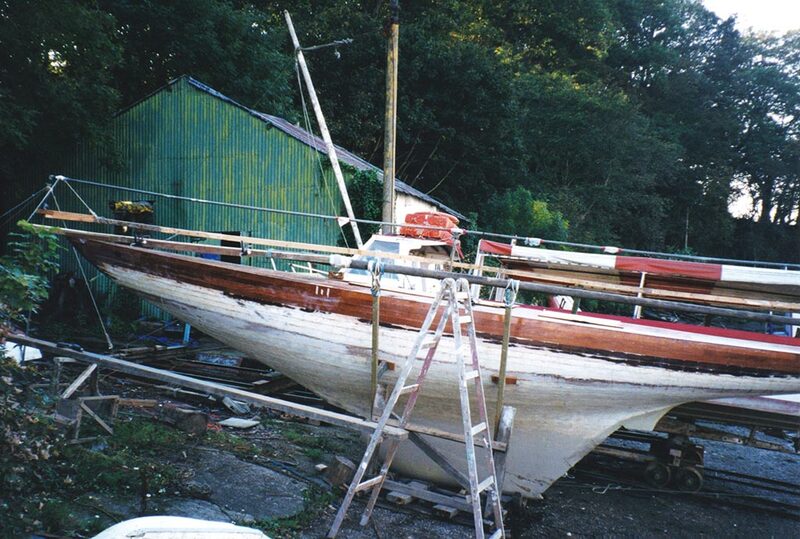 At the time that Kyria was built she probably was not expected to have a very long life, particularly as a racing yacht which would surely be superceded by newer designs. Back then racing yachts were considered old after a 20 or 30 year life. Therefore brass screws would have been considered more than sufficient, whereas bronze would have been a more appropriate material for the longer term. I am sure that her designer would have been very suprised to learn that these boats would still be around after more than 70 years - and what's more, still racing! The prospect of replacing the screws was made even more difficult by the fact that they had deteriorated to the extent that 90% of them could not be removed by normal means because the slots in their heads were crumbling when you tried to remove them (but the head itself still remained making it difficult to remove the screws). 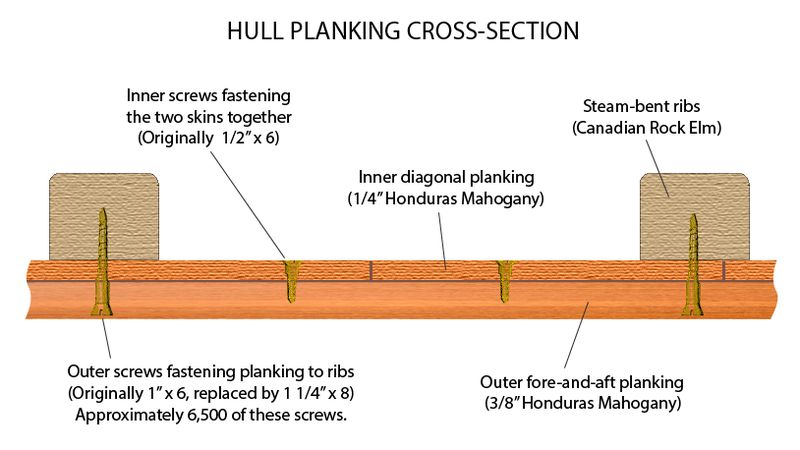 With approximately 6,500 screws fastening from the outer planking through the inner planking into the ribs, and nearly twice as many screws fastening from the inner planking into the outer planking, this was a major undertaking. Fortunately all the planking (Honduras Mahogany) was in relatively good condition, as were the steamed ribs, which are Canadian Rock Elm. 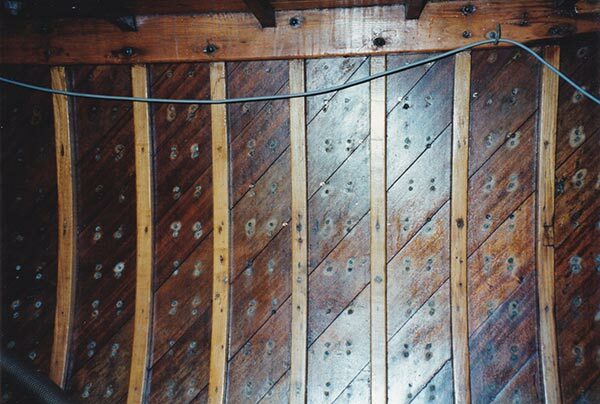 This photograph shows the ribs and diagonal planking on the inside of the hull and gives an impression of the large number of screws fastening from the inner planking into the outer planking (the section shown is just over 3 feet by 2 feet). The purpose of these particular screws was to restrict shear movement between the two skins, thereby reducing any flexing of the hull. There were other screws to fasten the outer planking to the ribs. This is a close-up shot showing the ﻿inner﻿ screws. The slightly reddish colour of the brass itself (not very clear in this photograph) and the green verdigris can be signs of de-zincification, but you cannot be sure until you test the mechanical strength of the material. In this case they had deteriorated significantly and were in need of replacement. Before I began the restoration, I considered very carefully whether or not the method of fastening that she had could be improved upon. 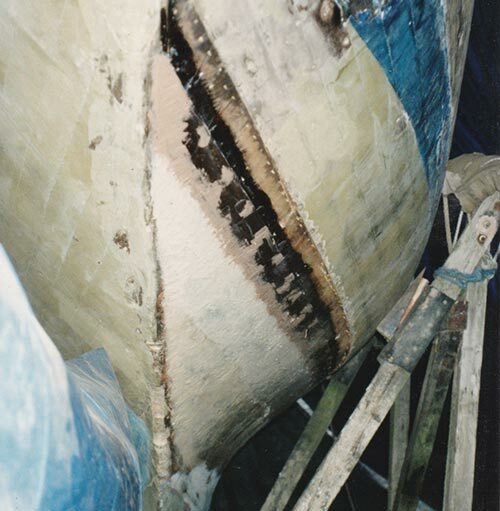 The inner screws were originally required to reduce shear movement between the two skins and hence provide the hull with sufficient rigidity to resist the forces imposed by the rig (which included the torsional or twisting forces exerted by the running backstays). What was needed was a system of fastening that would produce a rigid structure which would retain a high percentage of its stiffness after prolonged periods of use. 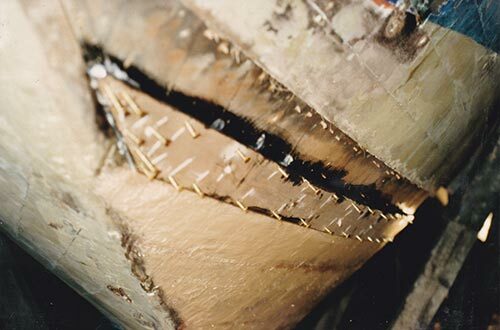 The problem is that when racing these fastenings are under continuous strain due to external forces acting upon the hull (mainly due to the rig). The smallest movement around each fastener, due to compression of the wood fibres or electrochemical decay around the fastening, can lead to significant loss of stiffness, which would make Kyria slow in anything stronger than a moderate breeze. Also movement in the joints would eventually lead to the ingress of water, which would weaken the hull even further. After giving it much thought, I decided that the best thing for her would be to bond the outer planking to the inner skin using a modern marine adhesive. ​Adhesives are very good at preventing shear movement (the sliding movement between the two skins) and would provide much better resistance to such movement than would be possible with mechanical fastenings alone. 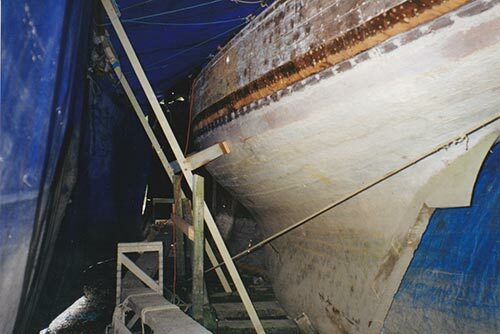 Also, with this method, once all the planking is bonded back in position it would not be possible to detect any changes in the appearance of the hull (either on the interior or exterior), and I wanted to keep her appearance as authentic as possible. Shoring to support the hull in the correct shape prior to commencing the work. 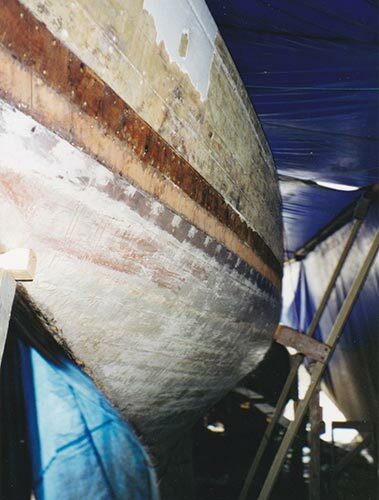 This was important because once the planking was bonded together the hull would then retain that shape. 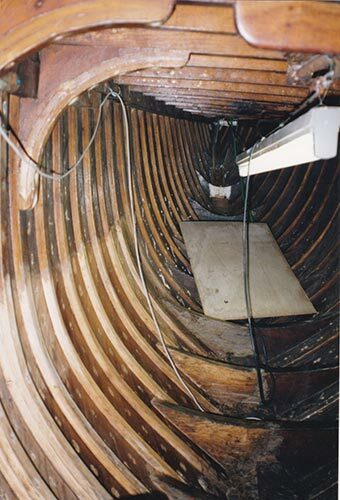 Below deck looking aft, prior to starting the work. Here the floors fasten the ribs to the horn timber or counter timber. The decision to use epoxy was not one I made lightly, but on balance I felt that it provided the best solution for the long-term. WEST SYSTEM epoxy resin is formulated to develop maximum physical properties while retaining just enough toughness and flexibility to live with the slight deformations which inevitably occur in any boat, giving a long-term fatigue performance comparable to that of wood. It also has measurable mechanical properties of its own and can contribute to the overall strength of the hull. There are some disadvantages to using epoxy though: the temperature must be greater than 5 degrees Celsius (preferably over 10 degrees Celsius) and the ideal moisture content of the wood is 8 to 12%. 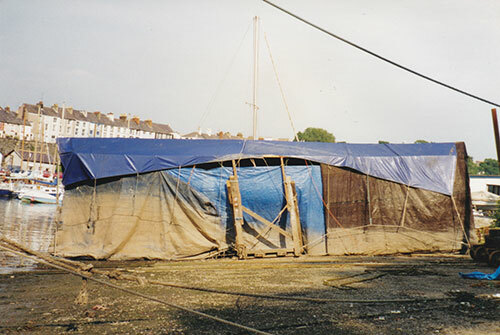 This meant that a 'tent' had to be erected over the hull and heating had to be provided to keep both the temperature and relative humidity within prescribed levels. Also protective clothing and other PPE such as gloves are essential when using epoxy. Another drawback with epoxy is that it is very difficult to sand (particularly if you get the resin to filler ratio wrong!) - but I'll come back to this point a little later. 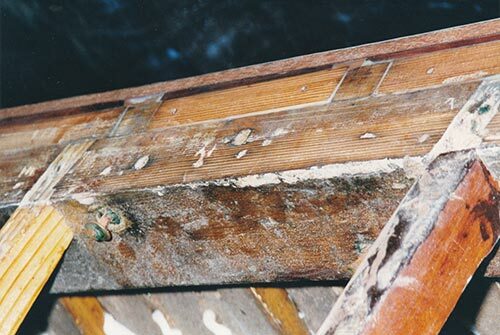 I recall an article about the potential pitfalls of using epoxy in old boats. It emphasised that there are really only two alternatives: either the timber had to be dried out thoroughly with each piece encapsulated individually, or epoxy should be used sparingly so that the timber can still breathe. 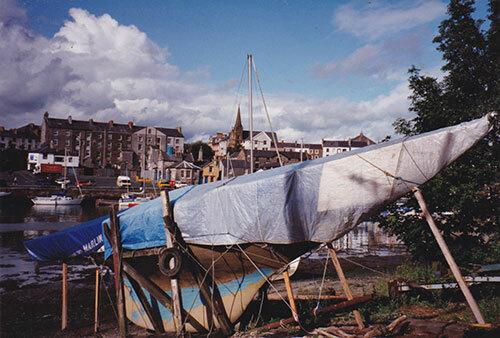 The first step was to erect a cover over and around the boat with as few openings as possible. The cover took on different shapes as the work progressed, but the photograph on the right gives an idea of the form it took. As the restoration began in the summertime the wood was already fairly dry, but I allowed it to dry further, under the cover, for a few weeks before starting. I also used a moisture meter to make sure that the moisture content of the wood was within prescribed levels. 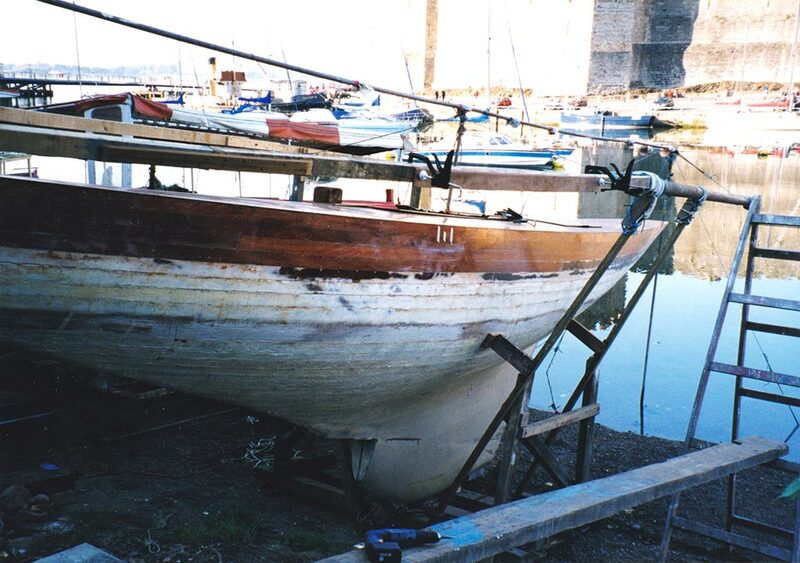 I decided to begin on the port side and removed the first plank next to the keel (the garboard strake) as this was the shortest plank and therefore the easiest to remove. As I mentioned earlier, most of the screws could not be removed by normal means. The heads of the outer screws had to be trimmed so that the plank could pass over them. Fortunately the inner screws (which were only 1/2" x 6 gauge screws) were found to have little or no holding power so they did not need to be removed before removing the plank. The plank was carefully lifted using a series of thin hardwood wedges to prise it away from the inner planking. The wedges were inserted in line with the ribs, or as close as possible to them, so that the pressure did not damage the inner planking, which have a thickness of only 1/4 of an inch (6.35 mm). 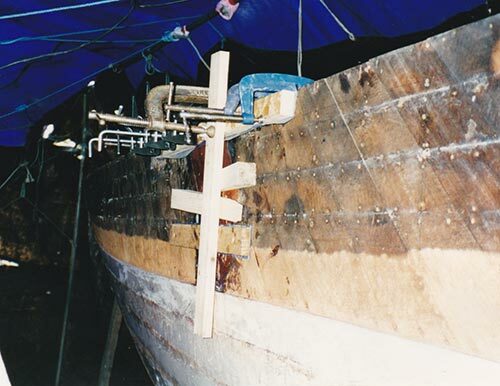 Once the first plank had been carefully extracted the second plank up from the keel could then be removed by the same means, but with a little less effort as it was easier to insert the wedges underneath the plank. The two skins had a layer of oiled calico between them as waterproofing and once this was removed the inner screws could be knocked through. The shanks of the outer screws were still left protruding, as only the heads had been removed, but these could be extracted fairly easily using a pair of molegrips (I say fairly easily, but the shear number of them meant that for the longer planks it would still be quite time consuming!). ​The mating surfaces of the inner and outer planks were then degreased, cleaned, abraded and then degreased again in preparation for bonding. Due to the oiled calico used between the skins, the surface of the wood was a little 'sticky' in parts and these areas took longer to degrease (this wasn't helped by the fact that my grandfather had injected linseed oil between the skins at various points!). Later on I came up with a method to clean and abrade the planking that avoided the need to degrease them, speeded up the process considerably and provided a much better surface for mechanical bonding (by very carefully using a rotary wire brush wheel in an electric drill, only just making contact with the surface, this removed the 'sticky' oil very quickly and provide a series of very shallow ridges in the surface of the wood which had the added bonus of giving the epoxy resin more surface area to bond to). 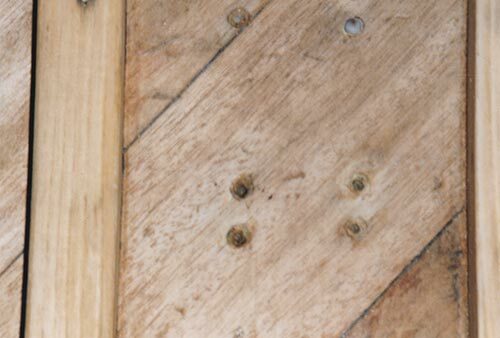 The outer screws, which fasten into the ribs from the outer planking, would still be required for two reasons: 1) To fasten the planking to the ribs; and 2) The peel strength of epoxy (as any adhesive) is not very good and so mechanical fastenings in the form of screws were still required to prevent any chance of the plank edges from lifting (even though in practice each plank edge would be bonded to the next plank edge and therefore any movement is highly unlikely). The original screws were 1" x 6#, but I decided to replace these with 1 1/4" x 8# screws. I had considered using silicon bronze screws as they would be much less susceptible to corrosion, but in the end I decided to use brass as each screw will be surrounded by epoxy resin (thereby sealing any moisture out). 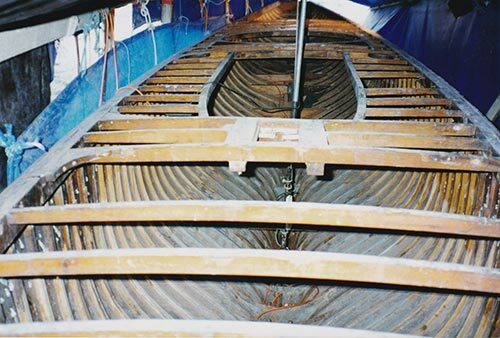 The outer planking were stripped of all paint, cleaned and abraded on both sides as they would be encapsulated with epoxy to keep their moisture level fairly constant at between 8 and 12%. This would limit expansion and contraction and the possibility of rot in future. In order to accomplish this I had to be very careful to ensure that each plank was completely encapsulated. Originally I did not intend to encapsulate the inner planks as they are only 1/4" (just over 6 mm) thick, and therefore the epoxy would be strong enough to overcome any expansion and contraction forces. At the time I decided it would have been difficult to achieve this properly without dismantling much more of the boat and I intended to just leave the inside well ventilated (but I later expanded the remit of the project and therefore now it will be possible to accomplish this). The old screw holes were re-drilled with slightly larger pilot holes and larger clearance holes were drilled in the outer planking together with slightly enlarged countersinks to take the larger screw heads. The first plank was then ready to go back on. 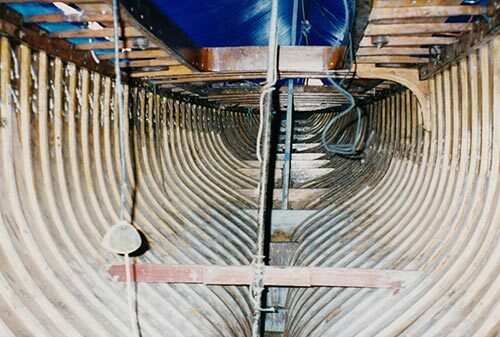 The mating surfaces of the planks were first "wetted-out" with resin, then a thickened mixture, consisting of resin and Colloidal Silica, was applied which would fill any gaps between the planks and also fill the seams between the inner planks. The plank could then be fitted back in place and fastened. The outside of the plank was then coated with epoxy resin and then the screw heads were covered with a mixture of resin and low density filler. 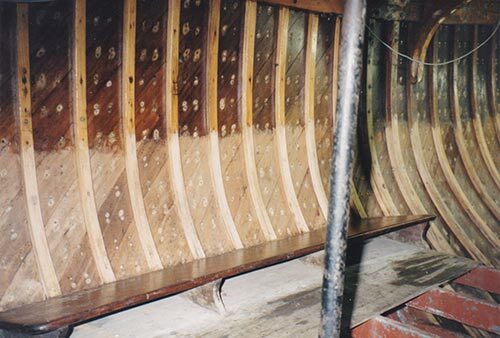 Once this had hardened sufficiently the plank was coated with a mixture of epoxy resin and "Microlight" (a very low density fairing compound) at a thickness of about 2 to 3 mm. In hindsight, applying the fairing compound in this way was a big mistake on my part, which has cost me a lot of time and effort later. 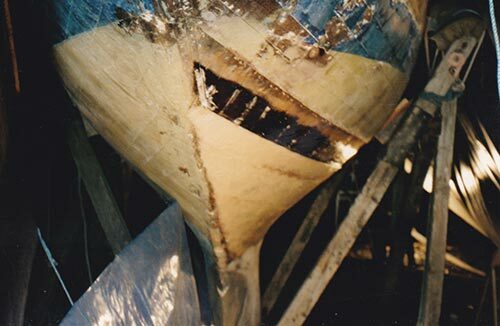 At the time I knew nothing about hull fairing and I also made the mistake of not mixing in enough of the Microlight powder, which meant that the mix had too much resin and was VERY difficult to sand! I will cover this subject in more detail in my blog posts later on. In hindsight, applying the fairing compound in this way was a big mistake on my part, which has cost me a lot of time and effort later. This procedure was then repeated for each plank. After the first plank was back in place, the third plank was removed before the second could be put back, and so on, all the way up to the deck. There were 28 planks per side, giving a total of 56 planks in all, taking an average of around 20 hours work for each plank! View from for'd, port side. Nine planks in position, the first five planks have been filled and coated with fairing compound. Plank 10 in position and holes filled with a mixture of epoxy resin and low-density filler (which still has some strength). 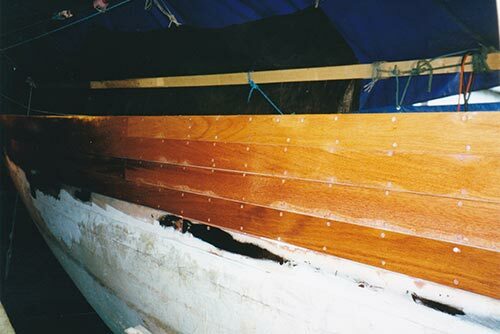 Fastenings were also required to re-fasten the planking to the floors (transverse timbers that are mounted across the keel and fasten opposite frames or ribs to the keel - see photographs showing below deck above) - these were 2 1/2" x 12 screws and were bedded in epoxy to seal out moisture and better distribute the load to the surrounding wood-fibres. 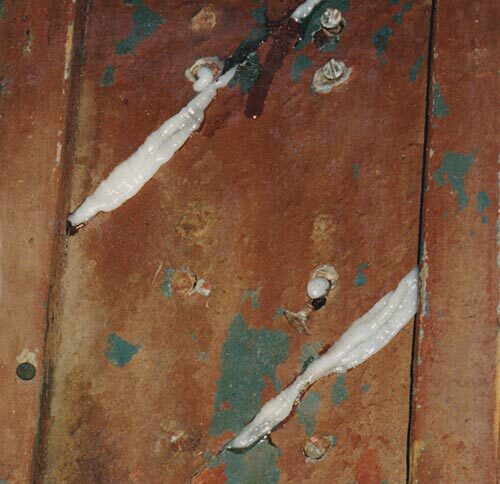 Close-up photo showing the Epoxy / Colloidal Silica mix squeezing through seams of the inner planking in the bilge area. 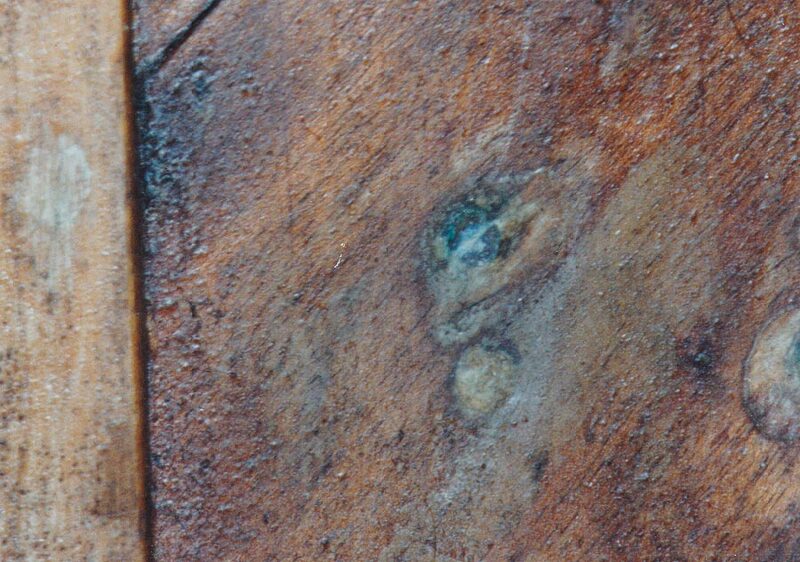 This photo shows an area of the inner planking where the squeezed epoxy has been chipped away and the varnish has also been stripped away, leaving the wood ready for sanding. This photo shows some of the inner planking along the port side after chipping away the epoxy that had squeezed through and stripping the varnish away in preparation for sanding. Progressing higher up with the planking. The slighly opaque colour of the epoxy on the upper plank is Amine blush, which is caused be moisture in the air or colder air when the epoxy is curing. This had to removed by scrubbing with warm soapy water and then sanding the epoxy to key it for the next stage. 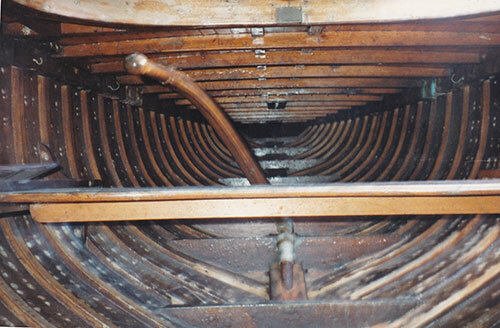 Another close-up photo showing the epoxy squeezing through the inner planking. There is a lot of waste here, but I preferred that than the possibility of any voids between the planking. The epoxy can easily be chipped away later as it just takes a layer of the varnish / paint off with it. Here the screw holes have been bored out, mahogany plugs have been glued in place and the planks and ribs have been partially sanded. Another photo showing the the interior along the port side. This one is looking forward. Only 7 planks remaining on the port side! 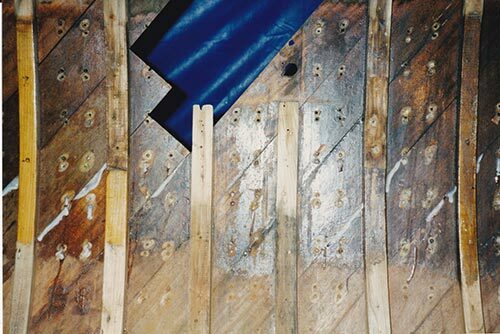 Some rot in the area of the chainplates, affecting the top 3 planks of the outer skin and also 2 of the inner planks. I decided to renew the top 3 planks for the full length of the boat and the 4th plank down for most of the length. 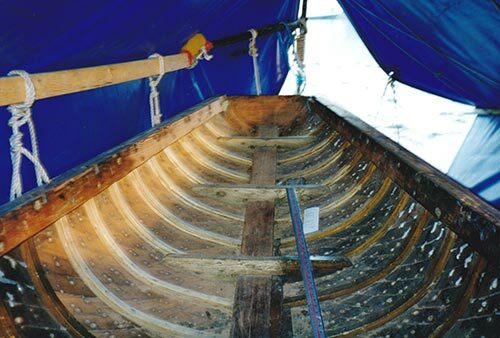 Outer planking removed and new pieces scarfed onto two of the inner planks. 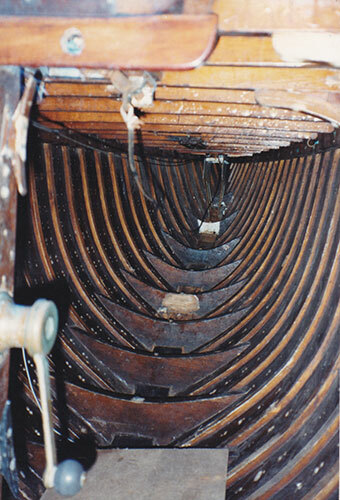 Photo from the inside showing the two pieces scarfed onto two of the inner planks and two of the ribs. The ribs are notched at the top to take the chainplate and then doubling ribs will be laminated on top of these running down to the keel and floors. Either side of the chainplates there will also be two ring frames laminated in place, together with a second beamshelf, around 3m long with tapered ends, glued and bolted below the existing beamshelf. 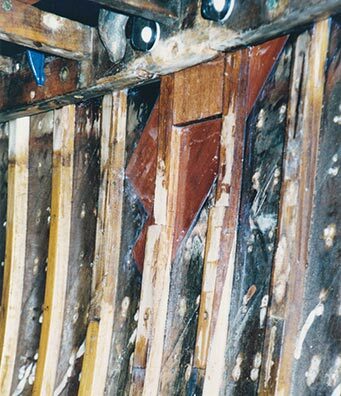 This photo shows the wooden blocks glued into place between the tops of the ribs and between the beamshelf and the inner planking. The outer planking has also been fitted at this stage. The result is that the sheer is now much stronger than it was previously, as all the components now act as one solid component (as opposed to individual components fastened together with mechanical fastenings, which inevitably allows some movement). The outer planks were removed and 2 of the inner planks were cut away in order for new pieces to be scarfed onto them. Two of the ribs were also cut away and new pieces scarfed onto these also. The clamps and wedges are used to hold everything in place whilst the epoxy cures. A thin film of polythene stops them from bonding to the epoxy. This photo is looking down at the edge of the deck, with part of the deck removed. You can see the beamshelf that the deck beams are cut into. Outboard of the beamshelf are the ends of the ribs and inbetween each rib is a wooden block. The purpose of these blocks was to take the ends of the inner diagonal planking, which you can see along the upper edge in the picture. I decided to extract each of these wooden blocks so that they could be cleaned and then bonded into place with epoxy (to the beamshelf, ribs and inner planking). This would then produce a much more solid structure at the edge of the deck, which would be better able to take loads at the deck edge. This work had to be done before fitting the top 3 or 4 outer planks as I had to be able to prise the inner planking away from the wooden blocks in order to extract them. This photo shows the four new outer planks at the sheerline, fitted and bonded in place. I couldn't find a good source of Honduras Mahogany at the time and decided to use a good quality Brazilian Mahogany, supplied by Robbins Timber in Bristol. This is very good quality mahogany and much better than some of the African varieties. Replacing the Deck - a slight change of plan! I knew that many of the deck beams needed replacing (in time), but I had originally intended to get Kyria sailing a little first so that I could evaluate the efficiency of her current layout. However, there was just too much movement in the deck and deck structure for my liking, and I wasn't happy with the idea of carrying out temporary repair work. 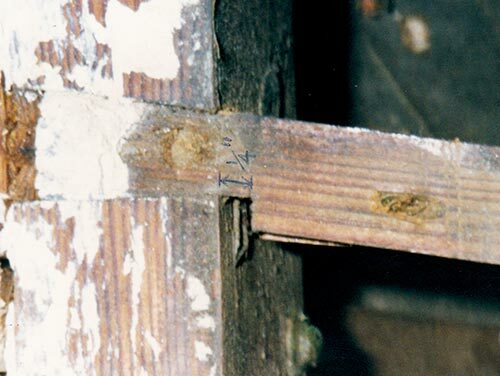 Closer inspection revealed that the ends of many of the deck beams had started to pull out of the beamshelves slightly - by up to nearly a quarter of an inch (just over 6 mm) each side in places. This was due to the topsides of the hull spreading slightly and was most noticeable with the beams of the aft deck. 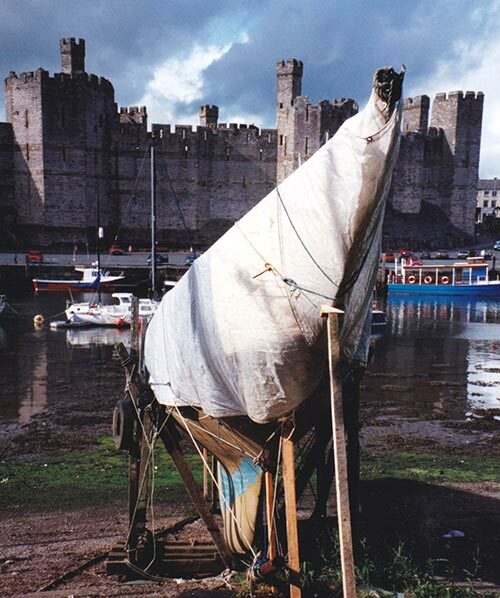 Obviously this was brought about by the strain produced when the stays were tensioned (forestay, backstay and running backstays), which tries to lift each end of the boat, causing the sides to spread. The same problem was evident where the half deck beams joined the carlings (the carlings are the longitudinal structural members either side of the cockpit that support the inboard side of the side decks). 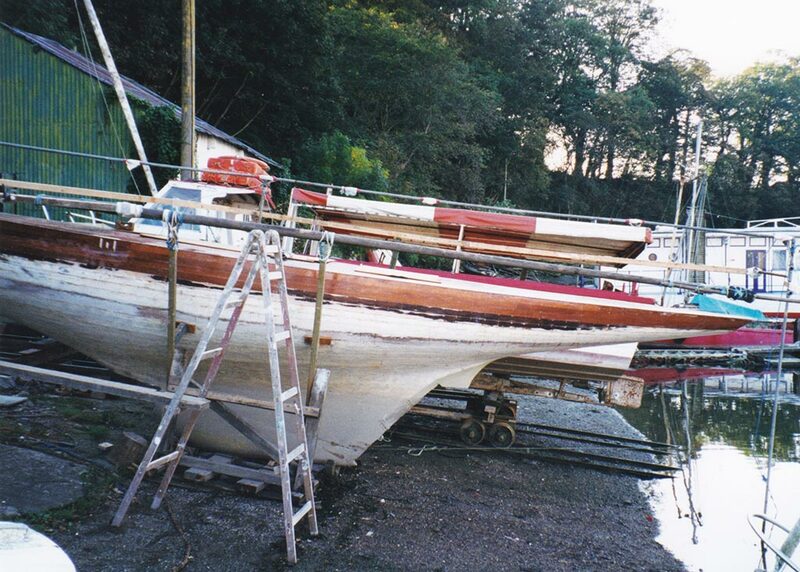 I had made a mental note of these problems when I first started the restoration and was planning to use tie-rods across the deck in the affected areas to hold the sides together. This would have solved the problem temporarily, but a much better solution would be to bond each deck beam to the beamshelves on each side (after closing the slight gap either side by pulling the sides of the hull together). Many of the deck beams also needed relacement and all this could not be achieved properly without removing the deck planking and deck beams. After some re-evaluation of the work, I decided to broaden the scope of the restoration to include the deck structure, and practically everything else in fact! I started to carefully remove the deck planking, which was quite difficult due to the method of fastening - 'secret nailing'. 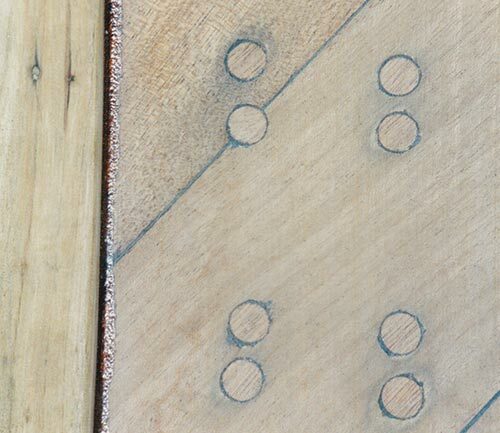 There were horizontal double sided copper nails (for want of a better description) joining the edge of each plank and then every plank was also nailed at about 45 degrees through one edge of the plank to the deck beams. Five deck planks removed along the port side. With many more to go, which is made the more difficult by the 'secret nailing' with hidden nails joining each plank and a nail through one edge of each plank into the deck beams. Looking aft below deck, with the opening for the crew cockpit overhead. You may just be able to see that the half deck beams along the port side-deck (on the right) are drooping slightly where they join the carling along the edge of the cockpit. 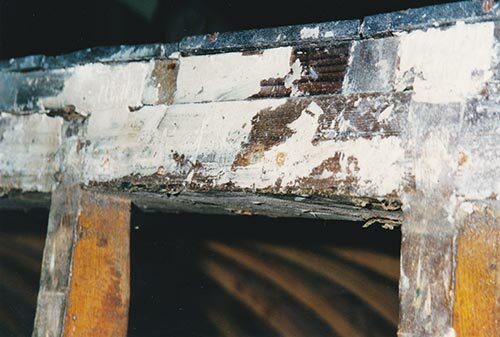 The joints in these half beams had also opened up as the sides of the hull spread slightly, weakening the structure of the deck. Looking aft, with the opening for the helmsman's cockpit in the foreground. Looking down at the half-dovetail joint between a deck beam and the beamshelf. 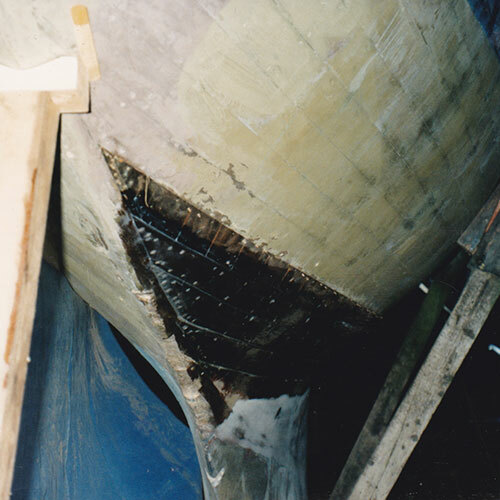 It can be seen that the deck beam had pulled out of the beamshelf by about a quarter of an inch (6 mm) as the sides of the hull spread. Looking aft. All the deck planking has been removed and some of the deck beams have been removed right at the aft end (either to be cleaned up or for replacement). Some of the deck beams in the more critical areas (such as the main beams either side of the cockpits) were replaced even though the original beams were still healthy (with larger sections better able to resist anticipated deck loads). The aft end of the boat. The deck beams have been removed for cleaning or replacement. I had originally intended to try and re-use the Oregon Pine deck planking, but later discarded this idea because I wanted to lay a marine-ply subdeck with relatively thin deck planking bonded to the subdeck. Such a deck structure would be stronger in all directions and would also be better at resisting the twisting forces produced by the running backstays. Imagine a box without a lid - it twists quite easily - whereas with the lid in place it is much better at resisting such forces (the plywood skin would act in the same way, providing diagonal bracing between the two sides of the hull and helping to resist any twsting). However, due to the way the Oregon Pine deck planks had been nailed, it would have been impossible to re-use them because whichever side I planed them down the dark staining around the nail holes would have been exposed and they would have looked awful. Also, despite taking care while removing the planks, a number of them had been damaged in the process. I therefore decided that I would lay a new teak deck on top of the marine-ply subdeck (consisting of teak decking strips about 45mm wide by 6 mm thick, which will be bonded to the subdeck). Most of the deck beams were still in good condition and could be cleaned up and bonded back in position. 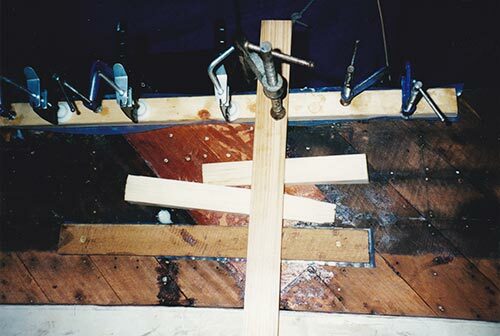 In areas where the sides of the hull had spread slightly I used a series of sash clamps to carefully pull them back to the correct position, before bonding the deck beams to the beamshelves on either side with epoxy. In some areas I felt that a number of the deck beams were too light, particularly where they were expected to carry rigging loads (such as the mainsheet). I decided to replace deck beams in the more critical areas and increased their section size accordingly. I also replaced the main deck beams either side of both cockpits, together with the carlings. I replaced these with Iroko as I felt it was important for the cockpit openings to be as strong as possible - so as to limit the inevitable weakening of the hull that results from any such openings in the deck. The marine-ply subdeck will also help in this regard. Originally the corners of the crew cockpit were almost square (except for a radiused wooden block at each corner, which the coamings butted up against). I felt that this was also a weakness, as there was no continuity of the coamings, and therefore decided to increase the size of the radius at each corner in order to allow the coamings to continue unbroken all the way around the cockpit (the coamings will be laminated in place from several thin layers and the joints will be staggered). I completed the work of cleaning and then bonding the original deck beams to the beamshelves, together with the new replacement deck beams in the critical areas of loading. I then faired the tops of the deck beams and beamshelves to ensure that the deck would be fair once it is laid. 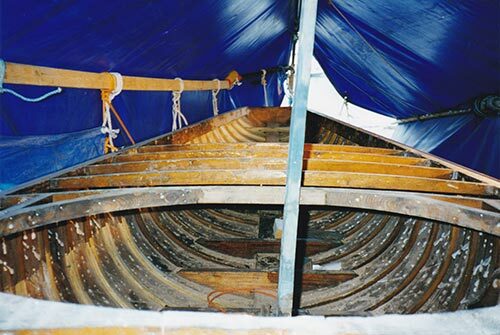 The thickness of the original deck planking was 5/8" (just under 16 mm). I decided that the replacement would consist of a marine-ply subdeck of 3/8" (9.5 mm) thickness and teak decking strips of 1/4" (just over 6 mm) thickness, giving a similar combined thickness as the original deck, although the new deck would be much stiffer as the ply would provide strength in all directions and all the components would be bonded together. I purchsed the best marine ply that I could find (Aquaply, supplied by Robbins Timber in Bristol) for the subdeck. A total of 7 sheets of 8' x 4' (2.4 m x 1.2m), plus 1 half sheet for a smaller section. 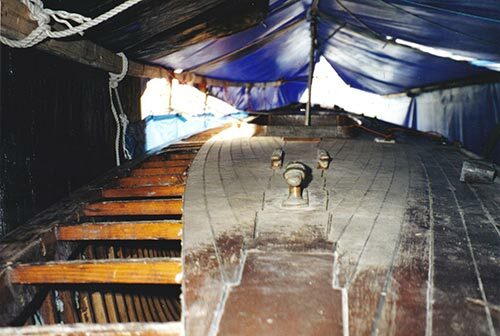 I laid the ply sheets athwartships across the deck in order to have greater strength in that direction in order to prevent the sides of the hull from spreading again. The teak deck planking bonded to subdeck would provide additional strength in a longitudinal direction and the beamshelves were strong in that direction anyway. The alternative would have been to lay the sheets longitudinally and that would have meant they would have been jointed down the centreline of the boat, which I didn't want. Each sheet was scarf jointed to the next with an 8:1 scarf (using a special jig for a circular saw provided by WEST SYSTEM) and of course these joints were all bonded together with epoxy. The subdeck was fastened with screws and bonded with epoxy to each deck beam and to the beamshelves on either side, making the whole deck structure much stiffer. Unfortunately I didn't take any photos of the deck beams being bonded in place, or of the ply subdeck being laid, and therefore I cannot show the process more clearly. Before digital cameras it wasn't quite as easy to take lots of photos as it is now, and perhaps I just didn't have a roll of film in my camera! The three photographs below were taken during one of the rare occasions when the cover was off the boat. On this occasion I needed to make some slight adjustments to the cover to allow more space for working on the deck (in preparation for laying the teak decking). These were taken in 1996 after the ply subdeck had been completed, but unfortunately the angle does not allow the deck to be seen clearly. The rudder had previously been removed for some repair work. A small section at the forward end of the lead keel has also been removed to get at some of the bolts joining the stem to the wood keel (even this small section weighed around 150 kgs!). The support for the cover was just something I cobbled together with various bits and pieces available at the time and was only meant to be a temporary structure for a few months (while I laid the teak deck). Amazingly, most of it was still intact 20 years later! I never actually got around to laying the teak deck at that time and this is one of the tasks that I still need to complete. This more or less completes the summary of the work undertaken during the first phase of the restoration. Looking back I'm not even sure why I did not carry on with it at the time. I think it was a combination of several things. I had started to try to sand the epoxy fairing compound and this was proving extremely difficult and seemed to be a never ending task. I had also started a new job and this was taking up all of my time and energy. As time went by it just seemed to become more and more difficult to find the time and motivation to re-start the project. Details of the second phase of the restoration can be found in the blog here, which I intend to update as the work progresses. I will try to post updates as often as I can, but please be patient with me as there will be times when there is not a lot to report and therefore updates will be further apart!